An analysis of hair and beauty products marketed to Black women found that approximately 1,177 products contain more potentially harmful ingredients than products promoted to the general public. An author of the report, Deputy Director of Research at EWGNneka Leiba, said products specifically targeted toward Black women are less healthy. “As a Black woman myself, I was disheartened that Black women have fewer options for healthier products when they are choosing from products specifically targeted to them,” she told TIME magazine. Leiba and co-authors of the report Paul Pestano, senior database analyst, and Brit’ny Hawkins, EWG consultant state that about one in 12 of the 1,177 products tested was ranked highly hazardous on EWG’s Skin Deep Cosmetics Database scoring system, which now rates more than 64,000 products. The cosmetic database compares product ingredients to more than 60 toxicity and regulatory databases and scientific studies. Products are rated from 1 (lowest hazard) to 10 (highest hazard). The EWR report indicates that less than 25 percent of the products marketed to Black women scored low in potentially hazardous ingredients, compared to about 40 percent of the items in the Skin Deep Database, which are marketed to the general public. None of the products marketed to Black women received a “low hazard” score in the categories of hair relaxers, hair colors and bleaching products, lipsticks, concealers, foundations and sun-protective makeup. Products with the highest potential hazard are hair colors, bleaching products and hair relaxers.The 15 hair relaxers evaluated scored an average of 8.1. For example,Organics by Africa’s Best Touch Up Plus Organic Conditioning Relaxer System received a 10 (highest hazard). It is indicated the product is likely to perpetuate allergies and immunotoxicity. Prior research has also indicated the chemical hazards of hair relaxers. The American Journal of Epidemiology released a study in 2012, “Hair Relaxer Use and Risk of Uterine Leiomyomata in African-American Women,” which linked the product to uterine fibroids, as well as early puberty in young girls. From 1997 to 2009, researchers followed 23,580 premenopausal African American women. 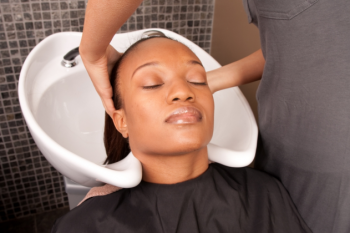 They assessed that chemical exposure through scalp lesions and burns resulting from relaxers may have resulted in a two- to three-times higher rate of fibroids among Black women. Hair texture has no connection to talent or ability. Yet some companies negatively judge Black women on the basis of their choice of a natural hairstyle. Joan Smalls, a biracial Puerto Rican supermodel who has walked the Victoria’s Secret runway, revealed during a panel on diversity and inclusiveness on December 3 that she has a hard time booking hair campaigns. “I’ve been an option, but they dropped me last minute, and the excuse was, ‘We were afraid to try something new,’ and by ‘new,’ they mean, ‘We never shot a Black girl,'” Smalls said. In September, in a 3-0 decision, the 11th U.S. Court of Appealsruled in favorof Catastrophe Management Solutions’, an insurance claims processing company in Alabama,decision notto hire Chastity Jones, a Black woman, because she has dreadlocks.The court asserted that it’s legal for companies to refuse employment based on hairstyles. Lissiah Taylor Hundley, diversity and inclusion strategist for Cox Enterprises (No. 18on the 2016DiversityInc Top 50 Companies for Diversitylist), commented on the fact that many Black women are embracing natural hairstyles in lieu of chemical straightening, regardless of company culture. “As we’ve come to appreciate our diverse beauty and the unique kinks and curls of our hair, some of us have embraced our natural hairstyles and wear locs and braids with pride and appreciation for our heritage and love of our hair texture,” Hundley told DiversityInc. Before most cosmetics and ingredients are sold, they don’t need approval from the U.S. Food and Drug Administration (FDA). Black consumers account for as much as 22 percent of the personal care products market, according to the report. However, thorough information on the hazards of products hasn’t been available until now. “We received emails asking for products targeting Black women” to be included in the Skin Deep Database, said Pestano, co-author of the report. The Environmental Working Group was founded in 1993. It specializes in research and advocacy in the areas of agricultural subsidies, public lands, toxic chemicals and corporate accountability. Ken Cook is the president and co-founder. EWG’s 18-person board of directors includes prominent physicians, policy experts, environmental activists, attorneys and executives, as well as members of the entertainment industry, such as actress Michelle Pfeiffer.